Google Home Max Review: Music Lovers Get The Perfect Assistant! Smart speakers have been quite a hit since the last 1 year! So far, while the technology has been impressive, none have been able to create an impact in terms of sound quality. While the products by Google and Amazon Echo are definitely one of the best in the category but, even they fail to stand at par with Sonos. Undoubtedly, the Alexa-powered Sonos One speaker does well but with Apple’s upcoming HomePod it looks like things are going to change. Google Home was answer to Amazon’s Alexa and now it looks Google’s Home Max is an answer to HomePod. The new assistant joins HiFi audio space and is capable of doing everything that a small Home speaker can do with the help from Google Assistant. It will surely cost you much but for the quality that it has to offer, it’s definitely worth it. Unlike other AI assistants Google Home Max is noticeable due to its large size and heavy body. The front has rounded corners and fabric covered speakers make it look attractive. In no way, the cloth covered speakers obstruct audio, it gives the same feel as Google Mini. Apart from this, visually nothing else is noticeable in the front. But when you look at the back side of the device you can find mic-mute switch, power jack, a USB-C port and a 3.5mm audio input. At the top, you can find touch-sensitive controls with a thin strip. Pressing at the center will help you pause and resume music. To turn volume up or down slide your finger to left or right. What is missing for now is that you cannot forward tracks. However, if rumors are to be believed, then Google might add this feature in a software update. The inside is packed with two 18mm tweeters and two 4.5-inch woofers to give amazing music experience with bass. Plus, the six far-field microphones ensure that Google Home Max can listen to your commands even when loud music is played. Apart from all this, the four LED lights veiled under the front cloth like Home Mini are great. They light up and turn orange when you say, “OK Google” command and stay on while the mic is muted. The visual indicator lights up when you adjust the volume using top of the assistant. Lights wouldn’t be seen often but they are there when needed. Setting the device is simple and same as other Google’s AI assistants. What you need is a Google Home app downloaded and installed, on your phone or tablet. Once it is done, plug the power cable into Google Home Mac followed by plugging the power cable into wall socket. Now open the Home app on your device and follow on screen instructions to connect the speaker to your WiFi network. If you are logging for the first time you will have to sign in to your Google account and train the AI assistant to recognize your voice. The reason for Home Max to be launched is to provide outstanding music experience to users. Just link supported music services (like Spotify, Pandora and Google Play Music) and ask Google Assistant to play any song or album that you want to enjoy. It is as of now the best smart speaker in terms of sound quality, with excellent bass and in-built voice-assistant features. Even when tuning speaker to a high volume the speakers don’t shrill. Home Max works well on both low and high volumes. 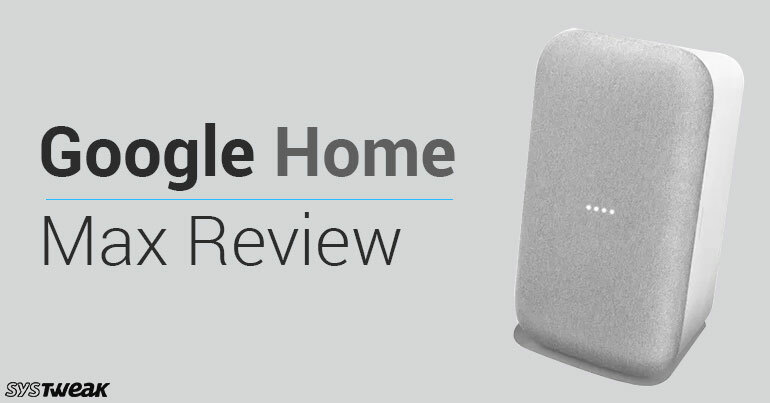 Google’s Home Max at present stands out, it is better than all the available AI assistants. Sonos One is excellent but it is much smaller and hold up well at low volumes only. When tuned to higher volume it shrills whereas Google Home Max wins in this area. But it seems the upcoming HomePod may give tough competition as Apple is coming up with many features with its AI assistant. Google Home Max is available at a price of $399 a decent price for a power pact speaker. Combining it with your music device will give an amazing experience and you won’t regret purchasing it. The in-built features and support of cast application make it even more worthy. At present, it does not have a huge library but its connection with Spotify is covering that up. A device with excellent sound, advanced features is a sure treat for music lovers. A must for voice-activated speaker lovers who always look for excellent sound quality. At first it may look expensive but for the price it is sold it is worth it.